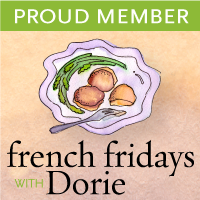 My Summerlicious round-up continues with my second stop: FRANK at the Art Gallery of Ontario. This has been another restaurant that has been on my list of restaurants to try for quite some time, and it was coincidence that it was housed in another Toronto museum. FRANK, named after Frank Gehry who did the re-design of the AGO, is headed by Executive Chef Anne Yarymowich, with Martha Wright as Chef de Cuisine (great to see two women running the kitchen!). Compared to the sleek décor of c5, FRANK has a warmer atmosphere when you walk in the door, with the wood details, splashes of colour (we were seated in a room painted red, which some people claim is the colour the helps encourage an appetite), and works of art on display. The glass dining tables, while pretty, caused the cutlery and our menus to go slipping and sliding every which way though. Made for some pretty funny pre-dinner entertainment I guess as I chased around my knife. My Summerlicious restaurant choices are always based on the menu they have to offer. I don't necessarily expect anything super fancy, but I do want good, honest food that will hopefully take into account the season and offer a good variety, including taking into account vegetarians. Thus, I especially appreciated the wide variety FRANK's menu had to offer, and the many choices available as well, with 4 appetizers, 5 mains (chicken, beef, fish, lamb and a vegetarian risotto), and 4 desserts. FRANK's menu also pointed out which dishes were gluten-free, which I thought was nice of them. The wine list features all Canadian wines (yeah! ), with some from the Okanagan Valley. Being a fan of whites, I opted for a glass of the Cave Spring Riesling. 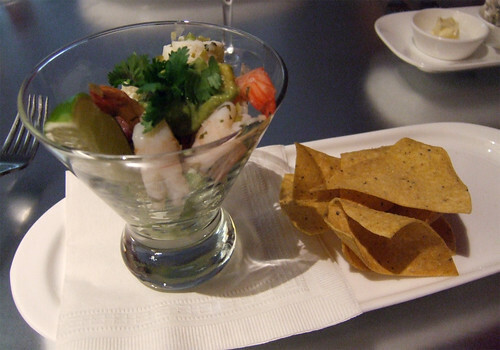 I started with the Seafood Ceviche—white shrimp, calamari and octopus with avocado guacamole, lime and fried corn tortillas. While the dish was refreshing, I found it a little on the bland side and the seafood slightly over-marinated for my taste. 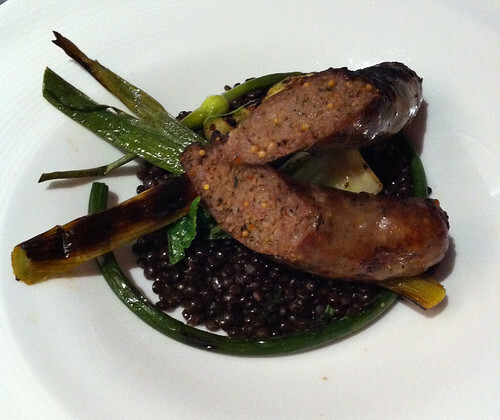 My next dish was the Grilled House-made Lamb and Lavender Sausage with Warm Beluga Lentils and Grilled Scapes. The sausage smelled absolutely divine as it was placed before me. Although lavender can be an overwhelming herb, it certainly didn't overpower the flavours of the sausage. Nice and lean but not dry either. This was a great dish. I've been surrounded by cherries for the last two weeks, and so to continue my cherry obsession, I closed out my dinner with a Sour Cherry and Almond Cobbler. I love the bright red of sour cherries, and it is such a perfect pairing with almonds. I just wish there was a little less cobbler and a little more sour cherries going on, because that dessert was super filling with the amount of pastry sitting on top of the fruit. All in all, FRANK was a good meal but it didn't really stand-out for me. 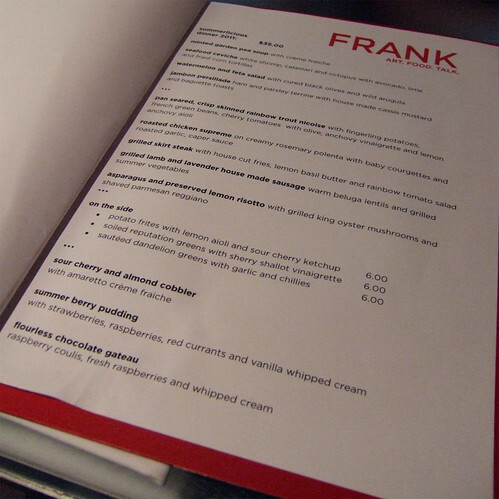 Whereas c5's food totally blew my mind, FRANK felt like just another meal at the end of the day. Granted, I never think it's ever fair to completely judge a kitchen based on a Summerlicious experience, as it is a totally different circumstance and they are, quite often than not, churning out the dishes for a quicker service in order to turn over more tables. I'll probably come back to FRANK eventually to try their regular menu—perhaps lunch or brunch, but that'll have to be later down the road. 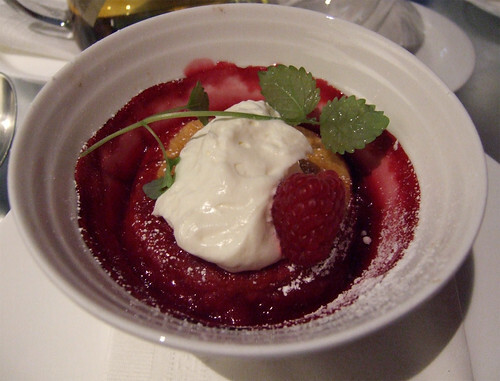 Read my Summerlicious experience at c5 here. Do you have any Summerlicious experiences to share? The Food Junkie July 29, 2011 at 9:10 a.m.
Great post :) I've been to FRANK before for dinner and it was so-so..didn't blow my mind for sure! iqster99 August 4, 2011 at 12:02 a.m.